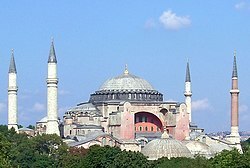 Constantinopolis (Turcisc: İstanbul, Crēacisc: Κωνσταντινούπολις oððe Βυζάντιον, Lǣden: Constantinopolis oððe Byzantium) is miclu ceaster on Turclande. Oð 1923 ƿæs hit Turcena rīcestōl. Beforan þe Turce anamon Constantinopolis in 1453 ƿæs sēo heafodburg þæs Ēasternan Rōmāniscan Rīces. 29 Þrimilce 1453 feall Constantinopolis þǣm Turcum unde Mehmet II, and mid hie feall þæt Eastrīċe. Of þǣm gēare ƿæs Constantinopolis Turca hēafodburg, oþþæt 1923. Man nīwanost wende þisne tramet on þǣre 00:47 tīde þæs 22 Hrēþmōnaþ 2018.